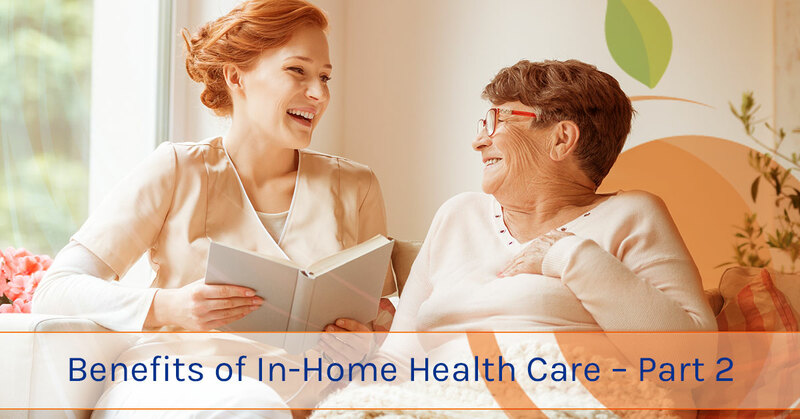 In our last blog post, we started talking about a few of the ways that your loved one can benefit from in-home care rather than a care facility or nursing home. While we were able to cover a few of the significant benefits, there are still so many other reasons that looking into in-home care is something we suggest everyone does. In today’s blog, we will dive even further into the benefits of this form of care so that you can get a well-rounded view of why this form of care is an option that you should take advantage of. When it comes to medical needs one of the most challenging aspects is medicine. Whether it’s help with prescriptions or remembering to take them, having someone that can help keep your senior citizen in check with their medication is a huge help. Given that medicine is a significant part of your loved one’s well being, it’s good to know that there’s a professional ensuring that they’re taking the right medication, at the right time. It may seem silly to see companionship listed as one of the benefits to in-home care, but it’s absolutely a perk, and the individual that will be receiving care is sure to make note of it. WIth one-on-one attention being provided day after day, it’s not uncommon for a strong bond to be formed between the professional and the patient. This is an excellent relationship for your loved one to have with their primary caregiver, but it’s also great for them, both mentally and emotionally, to have someone to spend the time with. A major concern with old age is the increased chances of accidents and injuries. Whether it’s a staircase leading to the bedroom or a slip in the shower, there are a lot of ways that elderly individuals can wind up injured. Rather than leaving your loved one with this risk, provide them with a professional that can assist them when needed. Not only will this keep them safe when they are physically challenged, but it will minimize the chances of any accidents and injuries from happening in the first place. You may be looking for a medical professional that can make day to day life easier for your elderly loved one. While having a medical professional at the home of your senior is the primary role that you’re looking to fill, there are a lot of ways that an in-home care professional will benefit the wellbeing of the individual in need. From diet and exercise to product and resource suggestions, your in-home care professional is always going to be providing you and the patient with valuable information and guidance that supports a healthy lifestyle. If you’re ready to get your in-home care services scheduled, then it’s time to contact OC In Home Care. As a team of dedicated medical professionals, you can count on the absolute highest quality of services being delivered on a regular basis. Learn more about the different in-home care services that we offer and contact our team with any questions or inquiries that you may have — we are always happy to help!